How I remember those days!!! What a great post! You couldn’t have looked cuter. I was in personal spaz mode from 7th through 10th grade when i finally realized that there even was such a thing as style. Hee hee, I think we were all in personal spaz mode. Thanks for commenting! Fun! 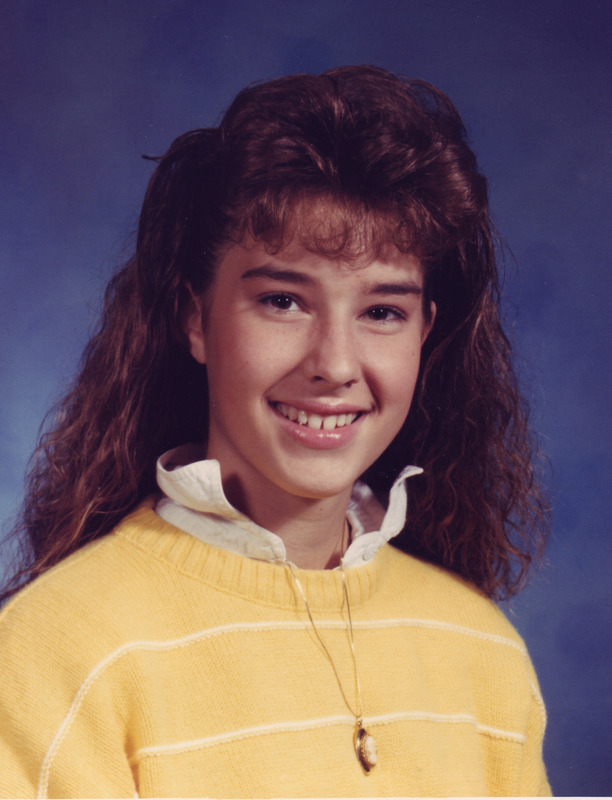 What I’m struck by (in addition to trying to remember where I might have a pic of my own 8th grade purple-sweatshirt-with-yellow-collar-sticking-up picture…) is how much you really grew between 9th and 10th grades. I mean, there’s definitely growth between each year’s picture, but 10th grade you seems exponentially older and different than 9th grade you, compared to the earlier years. And that doesn’t surprise me, because teens change so much, so fast, during the high school years. But it’s why experienced YA writers (and readers) can read a few pages and say, “That character seems more 13 than 14 to me,” or “more 14 than 15,” etc. I think that 9th grade year into the beginning of 10th grade, especially, is a time of huge identity and self-image changes, in addition to physical and emotional ones. I know what you mean, Emily! That’s so true. I just finished Shaun’s book, and I’ve been marveling at how much I’m missing in my boy characters. Never had sons or brothers, and I’m going through a series of “wows” and “Really?” as I realize the truth of who they are at age 15, 16, 17. Girls I think I get, but boys!? Oh dear god, I’m off the mark. Yes! 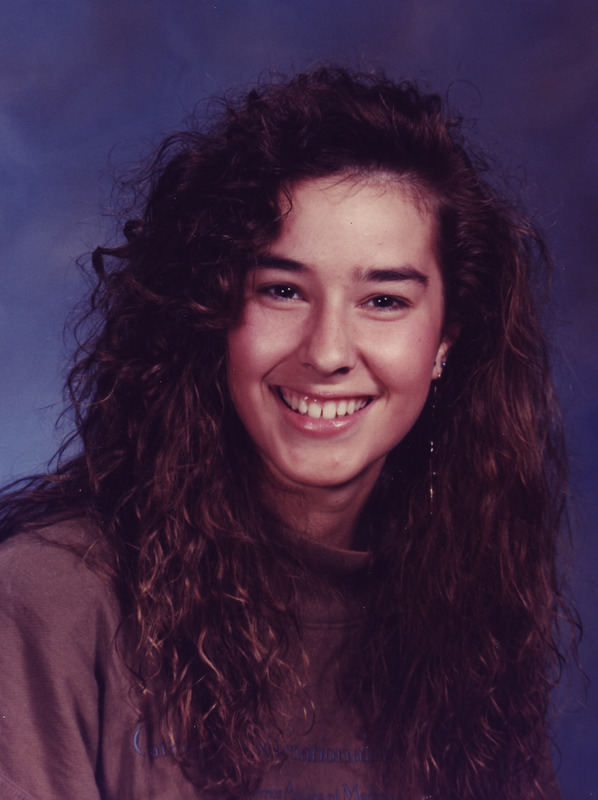 That’s some awesome Hoosier hair there. 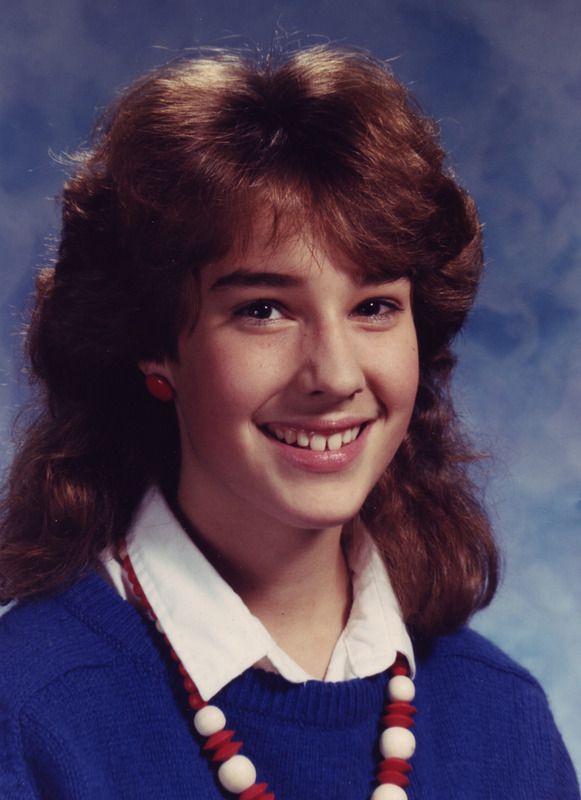 As a Bloomington kid, I tried to rock the hairspray, too, but my hair was too heavy. Had the shirt/sweater combo, though, come to think of it. As always, thanks for sharing! Oh I remember those photos. The queen of big hair! Always stylin’. I love to follow your blog. wow. as much as those hairstyles make me gag, if i remember the fads correctly, you were actually pretty hip! i just want to know *why* anyone ever thought those styles were cool in the first place! I agree with Emily — the difference in you from 9th to 10th grade is just ginormous. These photos are simply child/child/child/woman! You are just adorable in all of them. You’re right — the age differences 13, 14, 15, 16 — HUGE. I hate reading a YA book that has it wrong. If you need assistance to clarify boy stuff, ask away. Actual YA boys have taken over my house for years now, lol. Tammara, I’ve recently become very insecure about how I write teen boys. I’ll most definitely be calling upon your wisdom! You’re so brave to post pictures from your youth! I like to destroy most pictures of me between 3rd and 10th grade. 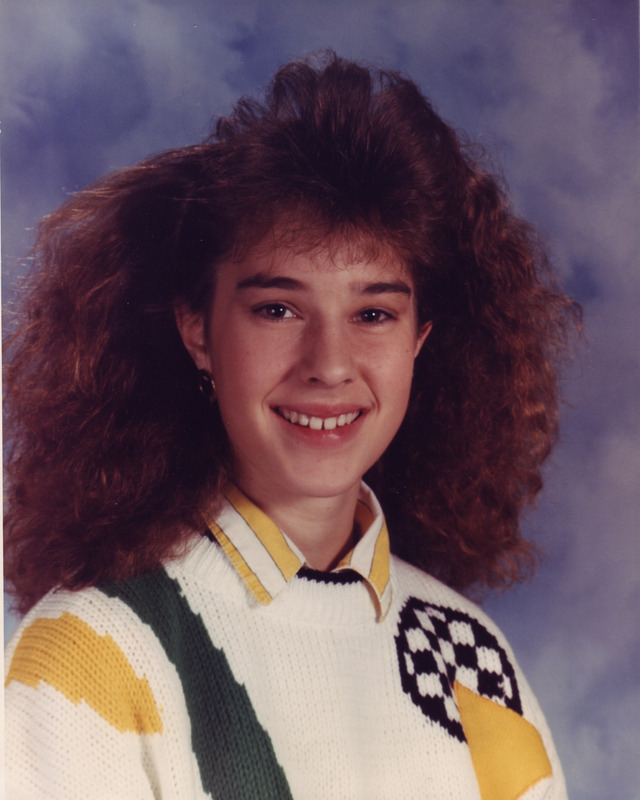 I had the permed puffy hair, too. Hahaha! Thanks for the compliment and confession. Permed puffy hair FTW!